Isn't it nice to know there is a Wall Street that will never ever crash. A Wall Street that will never become bankrupt, and better still, a Wall Street where you can take all of their money for a change! You might be wondering how, but I swear to you, it's true! All this and more can be yours with Playtech's Wall Street Fever! Up and down, the stock market may go, but round and round your reels may spin as you wager you're way to a better bonus, more money and additional assets. Ironically enough though, Wall Street Fever isn't open to American players most of the time, curious isn't it! 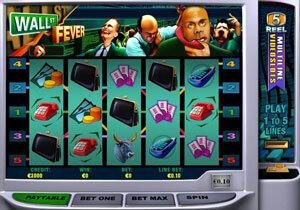 Wall Street Fever is a five reel, 5 pay line progressive slot game that offers its gamers the chance to pick up over one hundred thousand Pounds in their super progressive jackpots. With a minimum progressive jackpot guaranteed at £1,500 and the highest ever winnings reported at £300,000 you've got to feel certain that you can land somewhere in the middle and scoop up the shillings in this stocks based slot game. Taking it's shape loosely from the Wall Street stock market, the game features bonds, mobile phones, a fluctuating graph bar, dollars, purses, money and more as it's symbols as you set about to net five in a line to win the big bounty. To get your hands on the grand jackpot, you'll need to wrap up all five Wall Street symbols with all five of pay lines activated. But it isn't all hard. Collecting any of the Wall Street road symbols and you'll find yourself blessed with a wild ard, which can be substituted for any existing symbol to make up a winning pay line. Collect five such wild cards in a line and you could find yourself rewarded with a hundred grand in coins, or progressive jackpot itself if you've got all five pay lines activated. Wall Street Fever also has a free spin symbol, and if you collect three such symbols anywhere, then you're entitled to free spins! The number of free spins you receive depends on how many of the symbols you've found during your wager. But that's not all! If you manage to line up three Zig Zag symbols (that resemble a fluctuating wall street graph bar) you'll be entitled to have a crack at their bonus game, although it doesn't pay out quite like other bonus games on other slots do, sadly. So there you are. The world may be in a financial crunch, but the bright side is no matter what happens to Wall Street, you can still make sure you get yours. Take over Wall Street today, and have a share in their wealth!